Discovering Mai Chau won’t be enough without spending 2 days here. 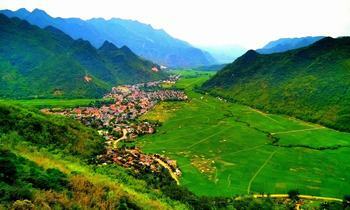 With various attractions of spots and cuisine, you will have an exciting experience in Mai Chau. For those who love to immerse in nature, majestic mountains, peaceful villages or want to meet lovely ethnic people, and learn about their unique culture, Mai Chau is an ideal destination. You are planning to travel for 2 days but still do not know what to pack, what to do, or what to see in Mai Chau, this post is exactly what you are looking for. Here are some of our tips that may be helpful for your upcoming trip. The weather in Mai Chau is cooling all year round but it is a bit cold at night, so you should bring long-sleeved clothes to wear at night. Because one of the best and most popular ways to discover Mai Chau is walking, it is necessary to prepare sneakers or sport shoes instead of high heels. Most of the guesthouses and hotels in Mai Chau require you to show an ID card when check-in (you also can show passport instead). If you want to rent a motorbike to explore Mai Chau, remember to bring a driving license. Glasses, gauze masks, towels, gloves, and shoes are must-have items in your backpack. You also do not forget to bring cameras or smartphone to capture the beautiful moments. You will have to walk a lot so preparing some snacks like milk, chocolate, candies, or fresh fruits is sometimes necessary. 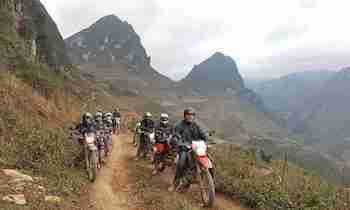 If you are a backpacker and want to be more adventurous, you can reach Mai Chau by motorbike. Compared to the passenger car, getting by motorbike, you will be more active and can stop anywhere you want. You should depart from Hanoi at 6 am to get to Mai Chau at 10:30 am. However, for safety, you also can go to the district by the passenger car. The cars going to Mai Chau often pick passengers up at My Dinh Station or their office. 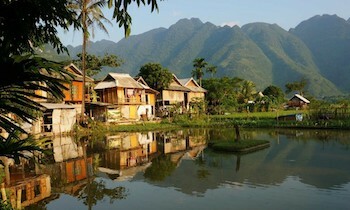 Mai Chau offers a wide range of accommodation from budget to luxury so you don’t need to worry much about this problem. To be more convenient and save money during your Mai Chau tour 2 days 1 night, you can book a hotel in advance. If you want to stay in a luxury hotel, Mai Chau Sunrise Resort – a new 3-star hotel will be an ideal choice. Otherwise, for those who want to learn more about the culture and daily life of ethnic people, you should stay at Mai Chau friendly homestay or guesthouses. 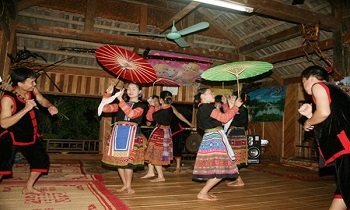 The price for a stilt house ranges from VND 500,000-600,000/night. If you are wondering about what to do in Mai Chau Vietnam, there are so many exciting things for you to explore. 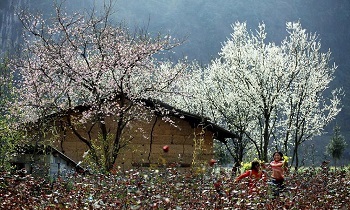 In October-December, you will be immersed in the beautiful scenery of spring, of peach and plum blossoms. 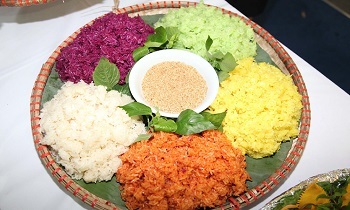 March and April are the seasons of “Ban” flowers, a typical flower of Mai Chau. You will go through the pass before getting to Mai Chau district. This is the road that all backpackers want to conquer at least once in their lives. Thung Khe Pass is also an ideal place to see Mai Chau from above. They are the two biggest and most crowded villages of Mai Chau. If you want to rent homestays, buy souvenirs, or discover the culture, festivals, and life of ethnic people, let’s visit these spots. Mo Luong and Chieu are two large and majestic caves of Mai Chau. The most interesting thing to explore these caves is the thousands-year-old stalactites with a variety of shapes and colors. Other destinations you can take a visit if you have enough time are Van village, Nhot village, terraced fields, Mai Chau flag tower, etc. 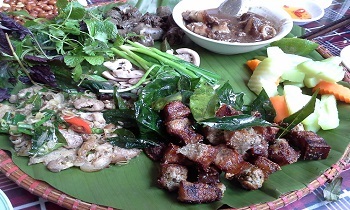 You can eat right at the hotel or homestay in which you are staying or visit Mai Chau market to enjoy specialties of ethnic people. According to our experience, the local homestay will serve you the authentic dishes of indigenous people at a reasonable price. Moreover, the Mai Chau market isn’t open all day. 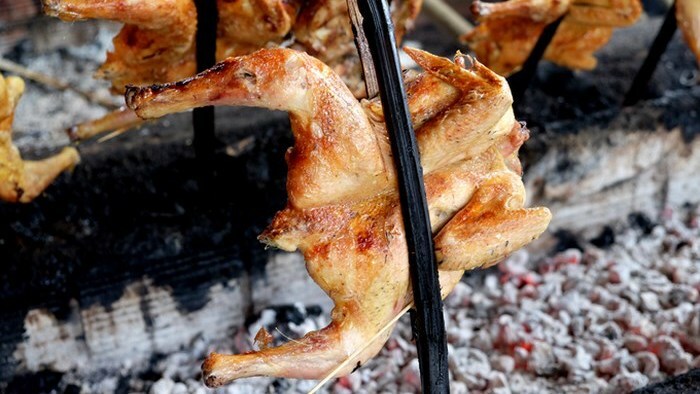 Some dishes you must try during your Mai Chau trip are bamboo-tube rice, sticky rice, Muong pork, bitter bamboo shoots, hill chickens, and grilled fish, etc. The above are all our suggestions for discovering Mai Chau for 2 days 1 night. Hopefully, these guides will help you have a safe and great trip here. If you concern more about Mai Chau tours and travel guides, please visit our website. Like and share if this post is useful for you. Thank you!